This page will guide you through configuration and basic use of the CRM Connect Sage 50 Complete Accounting Add-in.It is expected that you are already familiar with the Address Book, Call History and Preview window, and the basic concepts of integration and screen popping using the Add-ins.See the 'User Guide' for these topics. Sage 50 Complete Accounting and the database used to store your contact data should already be installed and working normally before proceeding with this integration. There are a few settings in or relating to Sage 50 that need to be configured in a specific way to enable CTI functionality and we'll run through them now. 1.Open the Run window from the Windows Start Menu, type 'odbcad32' in the Open text box and click OK.Note for Windows 7 users:You need to navigate to the 'Windows\SysWoW64' folder on your Windows system drive (e.g. C:\) and double-click the 'odbcad32.exe' file. 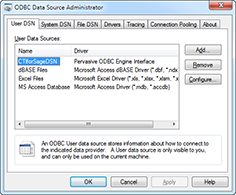 2.When the ODBC Data Source Administrator window appears, click the 'Add' button on the User DSN tab. For a standalone installation, complete steps 3 through to 5.For network installations, skip to step 6. 3.In the Create New Data Source window, select 'Pervasive ODBC Engine Interface' from the list and click 'Finish'. 4.When the Pervasive ODBC Engine DSN Setup window appears, enter a Data Source Name of your choice into the text box and select the appropriate option from the Database Name dropdown box.The database name appears as the company name from Sage 50.Click OK to store the details. 5.The Data Source Name you just added should now appear in the User Data Sources list on the ODBC Data Source Administrator window.Click OK, skip steps 6 to 11 and check the next section. For a network installation, complete steps 6 through to 11. 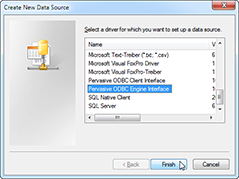 6.In the Create New Data Source window, select 'Pervasive ODBC Engine Interface' from the list and click 'Finish'. 7.When the Pervasive ODBC Client DSN Setup window appears, enter a Data Source Name of your choice into the text box and the IP address or name of the server where the Sage 50 data is stored into the 'Address' text box.Click the 'Create' button to continue. 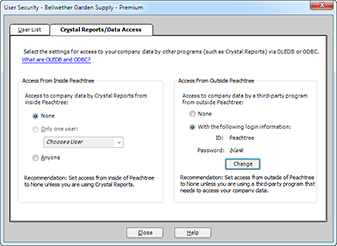 8.In the Logon window, enter the User Name and Password of the user that has access to the company data from Crystal Reports.If all users are allowed access, enter "Crystal" as the user name and leave the password blank.If access is restricted to one user only, enter their user ID and password.Note:Only the first eight characters of the user's password can be used when accessing Sage 50 data this way.Click OK to continue. 9.On the Create Engine DSN window, enter a Data Source Name and then select the Database Name from the dropdown box.The database name appears as the company name from Sage 50.Click OK to save the details. 10.The Data Source Name from the previous window will appear as the selected option in the Data Source Name dropdown box on the Pervasive ODBC Client DSN Setup window.Click OK to continue. 11.The Data Source Name you just added should now appear in the User Data Sources list on the ODBC Data Source Administrator window.Click OK. In Sage 50, open your company and then click on the 'Maintain' menu, select 'Users' and click the 'Set up security' option. On the User Security window, select the "Crystal Reports/Data Access" tab.In the 'Access from outside Sage 50' section, select the 'with the following login information' option.If the Password is listed as blank, click the 'Change' button to enter a new password and then enter it again for confirmation purposes. Right-click the CRM Connect tray icon in the system tray menu and then left-click the 'Configuration' option from the menu that pops up, this will open the 'configuration' screen.In the 'Integration' area, click the 'Add new' button, select 'Sage 50 Complete Accounting' from the 'Type' dropdown box and then click the 'Set' button. On the 'Configuration' group, select your Sage 50 data source from the 'Data source' dropdown box.If there are no options in this list, you need to set up a DSN (see ODBC DSN Setup above). 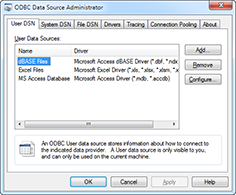 Enter the ODBC username and password to use when accessing the Sage 50 database externally i.e. not the information used to access the Sage 50 software itself.Your system administrator should know this if you don't. In the 'Entities' section, select the Sage 50 account contact types you want to be used by checking the corresponding boxes. The first time you pop a Sage 50 contact you will be asked to confirm that it is okay to do so by clicking Yes in the message window that appears.Check 'Remember this setting' to prevent the message appearing every time you pop a contact. To test if the configuration worked, enter a phone number from your Sage 50 Complete Accounting account into the 'Telephone' box in the 'Integration test' area and click the 'Search' button.The results will be displayed after a few seconds. When a call comes in, the CRM Connect 'Preview Window' will pop up and display the phone number that is calling.If the caller is recognized as one of your contacts from Sage 50, their details will also be displayed and you can 'pop' their Sage 50 contact record by clicking the 'Sage 50 Complete Accounting' button in the window. You can also pop recognized callers' Sage 50 Complete Accounting contact records by clicking the 'Sage 50 Complete Accounting' button on the 'Phone Window'.